Apple has officially announced the iPhone 5, an announcement that has been long anticipated and much hyped, but is the new phone worth the wait? Initial inclinations point to no. While the iPhone is lighter, thinner and faster than the iPhone 4 and iPhone 4S, it doesn’t bring anything new or groundbreaking to the table that hasn’t already been done by Android or other smartphone developers. If you come down off your excitement high for a moment and really look at the new iPhone, has Apple really added a single, legitimately new feature? The answer is no. There is nothing groundbreaking here, nothing that will make people look at the iPhone 5 and honestly go “wow”. I mean, the biggest thing Tim Cook and company stressed during the announcement was all the work that went into the new, larger screen, which is still smaller than other devices, like the Galaxy S III from Samsung. The lack of any real new feature won’t mean much to the average Joe consumer. Most of these people can’t see past the words “Apple iPhone” anyway, so you could essentially hand them a brick that says Apple iPhone on it and they would think it was the best thing on the market. But for anybody with half a brain that does their research, they will see that the iPhone 5 isn’t the market buster that it was poised to be and is, in fact, just another smartphone for sale. When you break it down, what exactly did Apple talk about during the press conference? There was a lot of talk about the addition of 4G LTE, something that has actually been on a lot of smartphones for over a year now. There was talk about the ability to take a photo directly from a video, which is cool until you realize that the Galaxy S III and One X can do the same. Putting together a group of photos in Panorama mode was also mentioned, though is also available on the new Droid Razr phones. If you haven’t been paying attention, there is nothing here that sets a new bar for the industry, at least not in the way the original iPhone or iPhone 3G did. Everything that the new iPhone 5 has to offer has already been done before by other developers, leaving Apple, for one of the first times ever, behind the curve. Yahoo! has actually made a nice comparison chart pitting the new iPhone 5 against some of the other popular smartphones on the market, including the phone I recently purchased, the Galaxy S III from Samsung. The list, which can be found below, compares the iPhone 5’s screen size, operating system, cameras, battery and size, offering some pretty interesting statistics if you ask me. The stats speak for themselves. In comparison to the Samsung Galaxy S III, which is the most popular 4G LTE smartphone on the market right now, the iPhone 5 has a smaller screen, a lower-resolution front-facing camera, a weaker battery, and is generally smaller all around. In fact, the iPhone 5 ranks last in every single category out of all the phones listed (Galaxy Note II, Galaxy S III, Razr HD, Lumia 900, iPhone 5). Overall, the hype surrounding the iPhone 5 was more than what Apple delivered. What we have here is a somewhat generic 4G LTE smartphone that is outmatched by at least four other phones, not to mention the fact that it brings absolutely nothing new to the table. Add that to the fact that Apple could be sued by HTC and Samsung for (ironically) patent infringement over 4G LTE technology and you have one big dropped ball from Apple. If you still think the iPhone 5 is the greatest thing since sliced bread then by all means, throw your money at Apple once again. Pre-orders for the device will become available on Friday, September 14th with actual shipments of the phone going out on September 21st. 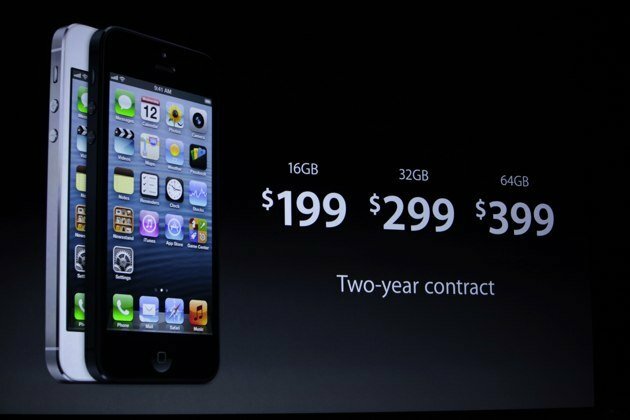 Pricing is the same as the launch of the iPhone 4S with 16GB, 32GB and 64GB versions available for $199, $299 and $399, respectively. I’ve been waging to get a Samsung Galaxy S3. The main thingi don’t like about the iPhone 5 is the size. I love the size of the S3. Also I have an iPhone 4 so what’s new-nothing. At least with the S3 I love the deign and there are a few unique technologies. The camera s better. Why would I replace my iPhone 4? The 4s and now the iPhone 5 don’t give me any incentive. Same width just longer? It has a few more microphones which might help call quality but if you’ve got good reception it’s a moot point. I’ve got a retina display andv high quality video recording. The front facing camera not as good as the Samsung. The processor and ram are very good if not better on the Samsung. So what’s Apple’s selling point ? THERE’S just nothing new. What can you do n the 5 that you can’t do on the 4s? They dropped the ball and I’m glad. Getting nothing off their exaggerations and lies. if Apple has let just the lovers of Iphone come up with a new design by doing a competition or something like that and choose the best design to adapt it to the iphone 5 ,i’m certain we would have seen some amazing designs and the iphone 5 could have been so innovative in term of design, so sad. seriously, all this time the whole world was waiting for the new iphone 5 , I have always been a fan of iphone judging the change between the first iphone I had till the iphone 4s which was the last one I bought but really an iphone 5 with just a big screen and a little options that I’ve the feeling I’ve seen them before, I mean where is the innovation , I was so much looking to buy the iphone 5 because I thought it would be as I’ve imagined it in my mind; new , stylish , a complete new design not an iphone 4s XXL, and really new extraordinary options and I’ve to say I was more focused on the design and all we get is a stretched out iPhone 4s with a new processor and a camera , I will definetly buy the Galaxy S3 because I’ve to admit I love its shape it fits so nicely in your hand and we can say that there is indeed a big diffrence between the Galaxy S2 and S3 so goodbye Apple for now, next week I’ll buy my new Galaxy S3 , maybe I’ll comeback to Apple one day if they come up with an iphone 6 REALLY DIFFRENT , sorry to say but I thought the Apple designer ” jonathan ive ” was more clever than that. The biggest problem I see is that we expected something better. I love how Apple is supposed to be an “innovative” company and here they are putting out a new iPhone, which is one of their best products, and its just a catch-up-to-the-rest-of-the-industry product. Why would anyone want a mini tablet like the S3 in their pocket? That’s why I like smaller phones.